The first thing that can be noticed about the Gator XUV is that it is as impressive as it is imposing. At 77 pounds and 54 inches in length, and styled with bright green and yellow paint, the electric car is definitely difficult to miss. 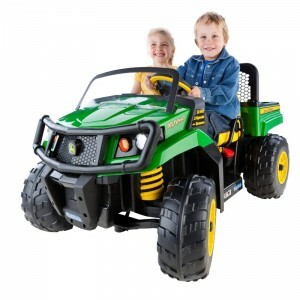 Capable of carrying two riders (with 130lbs combined maximum weight) and travelling at two different speeds: 2 1’2 miles an hour and 5 miles an hour (with a second speed lockout for beginners), both timid and daredevil children will be able to use the Gator without parents fearing for their safety. 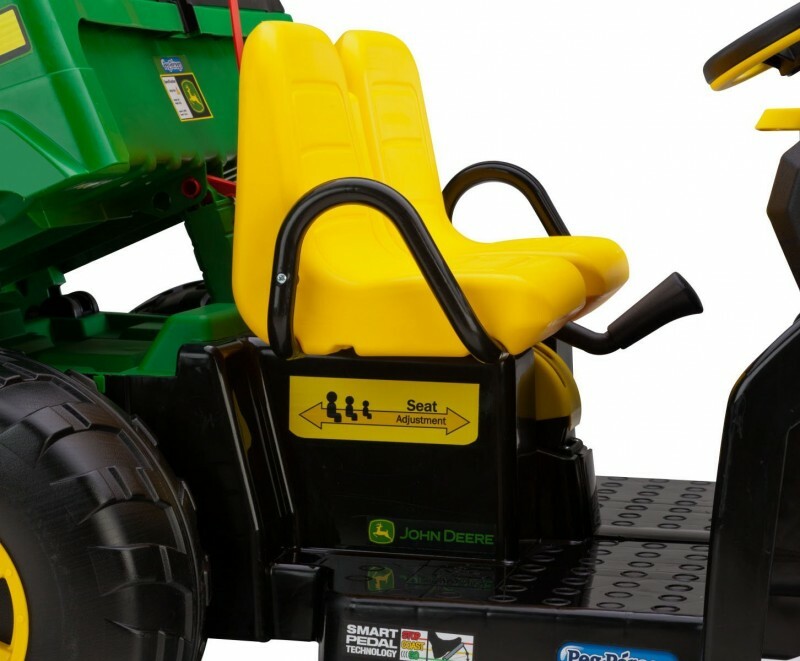 As well as the two speeds, the John Deere Gator is also capable of travelling in reverse and features an automatic breaking system that engages the moment the child takes their foot off the accelerator. The Gator XUV has a convenient 12-volt battery and charger, which will keep the electric car going for up to 20 hours – in turn keeping children happy for hours and giving parents a bit of time to themselves. 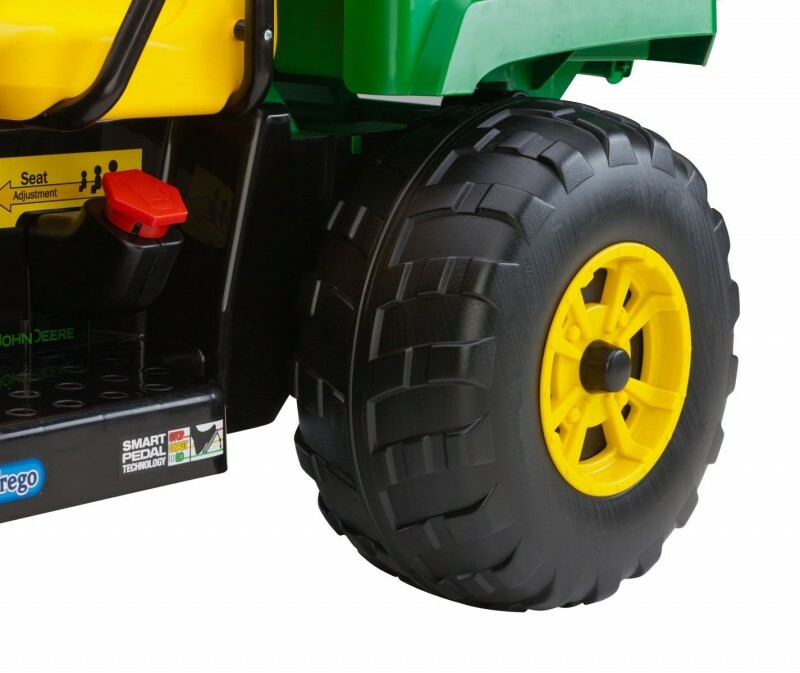 The super traction wheels mean that the electric rideable car can travel over dirt, grass and rocky terrain, just like a real-life 4x4. 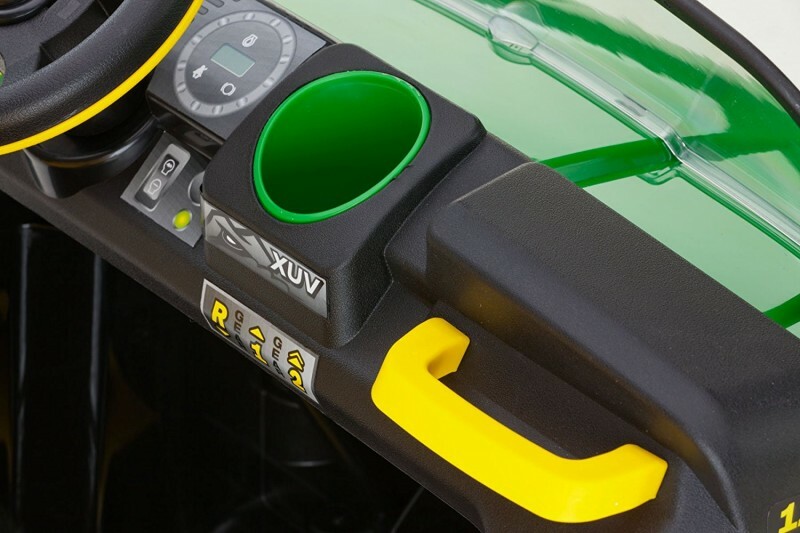 No electric rideable car would be complete without some type of cool workable feature, and the John Deere Gator XUV is no exception in this regard. The car boasts a large dump bed (complete with a working tailgate), that lets the children haul anything they want around the garden – be it mud or toys and then easily dump it off the back via the use of a simple pulley system. This gives a fun extra feature to the XUV and allows children to be creative, and use it in different ways. Children grow up fast, and the Gator XUV caters for this with adjustable seats which will allow the child to remain comfortable and keep them riding for much longer than would be otherwise possible, meaning that the parent won’t have to put their hand in their pocket to buy a replacement after only a year or so. 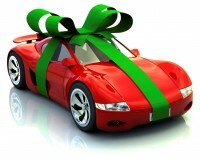 One of the benefit is a healthy 18-20 hours of runtime before the electric car battery needs charging. In addition the car is quite fast when in its second setting, which makes older children happy. 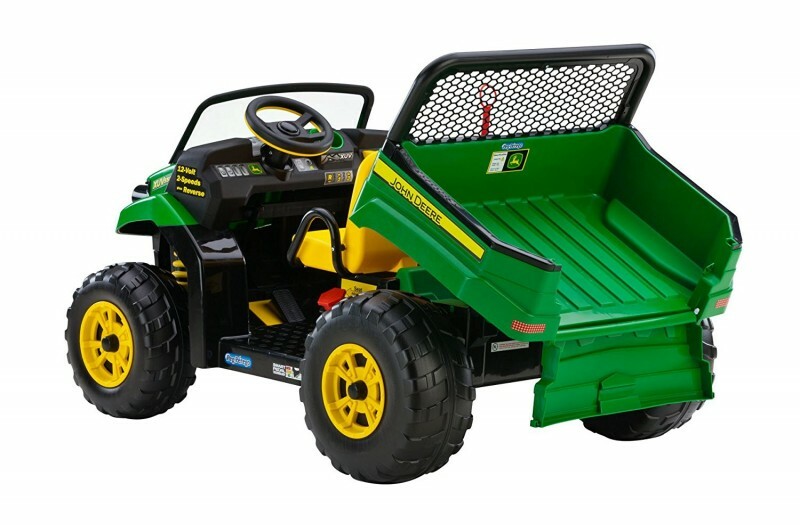 Peg Perego are clearly very confident in the John Deere Gator XUV (which is created in made in Fort Wayne, the United States using the very best international components), and offer an extended two-year warranty for a total of three years. All the company require you to do to be eligible for that extra peace of mind is to complete the online registration and return the form that comes with the product itself. Only one con of the product is the price. It isn't cheap product.